So Nifty has been rocking the charts at it’s all time high and with many speculators claiming each day to be a top while prices keep on rising. This is not something new in a bull market rally however today here are the list of reasons why I feel that it could a short term top meant for correction till 9000 or lower. The OI Buildup in 9500CE is greater than the 9500PE Buildup while Nifty closed at 9525.75 (spot). Though roughly balanced, ideally CE OI greater than PE OI denotes conviction by the smart money that the prices are expected the close below 9500 in the near future. If the prices do close above 9500 the writers will be underwater and the short cover could catapult Nifty to knew highs! A very basic indicator is the market breadth, shows a divergence and 588 stocks advanced while 817 declined. This generally shows that most of the stocks are not participating in the rally and is very unhealthy for a steady upmove. If we look at the charts of Nifty and Bank Nifty, there is a divergence, we saw divergence initially where Bank Nifty went to ATH while Nifty consolidated, now we saw Nifty at ATH while Bank Nifty yet to form the ATH. This again shows that the conviction of the upmove is not reliable. These are some of the reasons why you could pinpoint this price 9530 is the short term top. This does not mean shorting is the best idea, I would probably suggest buying more equity at lower prices as the bull market still has some steam left before the tables turn! In this post I would like to explain the basics of Options, the post is intended for the complete beginner. I will try my level best at explaining about Options Trading with respect to Indian Markets. I will try to explain it using Questions and Answers as I feel its the best way to explain things, also if you have any other questions you are welcome to comment down below. Options is a type of derivative instrument, it is called derivative as they derive their value from other securities. Confusing at first but if we consider Nifty as the base security, there are Options of Nifty whose prices are derived based on the value of the underlying i.e Nifty. Like Nifty being the base instrument there are options for different stocks present in the F&O list. They have an expiry date like the futures (last Thursday of each month) and there are up to 3 month contract available to trade with the maximum volumes in the current month. There are something called Strike Prices for Options more on this later. Call Option – It gives the buyer of the option a right but not the obligation to purchase (in case of Nifty Call Option) Nifty or other securities at a determined price. Now how does this help the Buyer of a Call Option? As I told before, there are something called Strike Prices for Options. 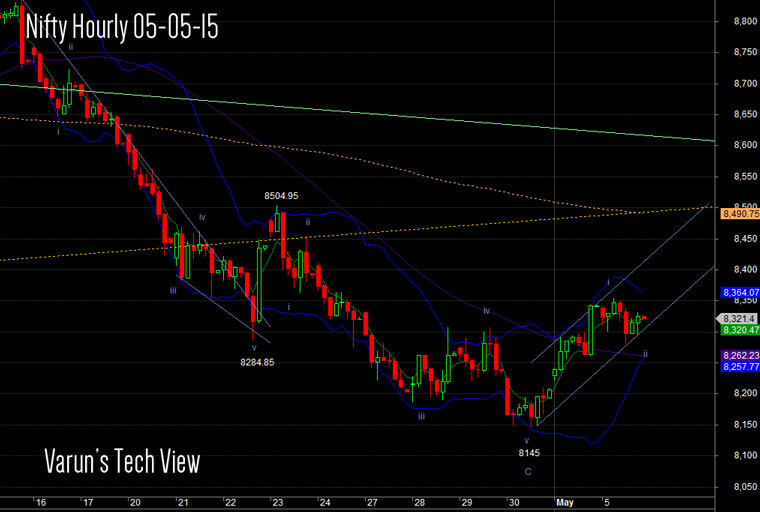 In case of Nifty, As the current closing price of Nifty is near 9304. If you were to believe Nifty could touch 9500 in the coming month what could you do? You could have a long position in a Futures Contract. You could possibly buy individual stocks based on your view. Now we are back to Strike Prices. There are different strike prices for each security and I could buy a Nifty Option of Strike Price 9500 for the coming month for which I would have to pay a price equal to premium for the right and could profit say once Nifty reaches near that levels. To buy an option the margin required would be limited to the option premium and the lot size. So for only 2k you can keep a position. With this I would like to end the post, a continued post while be posted later explaining the Put Option and some basic Option Greeks. 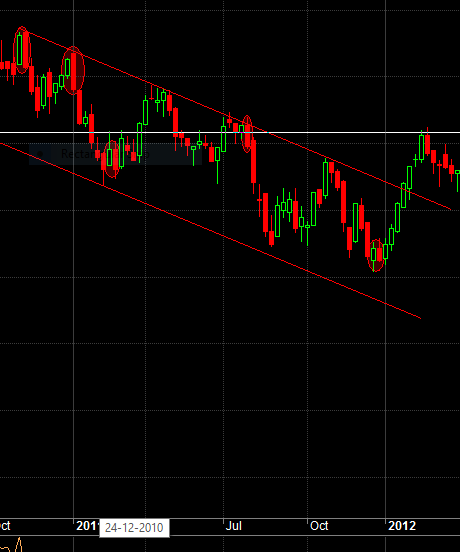 Now we have seen the retest of the trend channel which is now acting as support shown in the blue circle. I have tried to highlight with the curves a potential Head & Shoulders Pattern emerging which if successfully makes it will have a potential target of 9181 using conventional technical analysis which is close to the all time high of 9119. Although that is a very far target and should take some time before it reaches if at all medium term places of interest are also highlighted in the green areas. For now its a wait to see whether the red area is breached successfully with sufficient volumes to even think of medium term areas of interest. 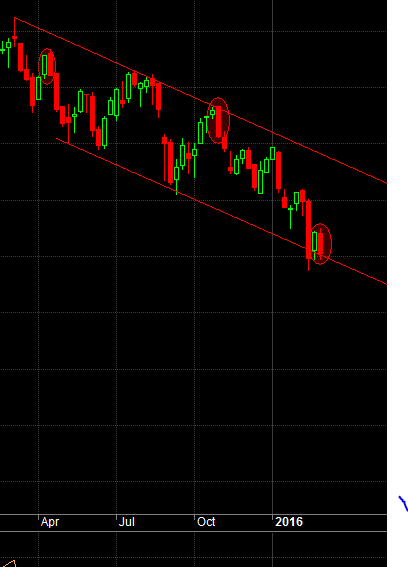 In my previous post I had highlighted how Nifty had formed a bearish engulfing pattern right at the bottom of the trend channel which was active since March of last year. While posting that I had given examples how earlier an bearish engulfing pattern actually cauight the exact lows and we rallied from that point onwards. I am no fortune teller and whether the low of Nifty which was formed stays as is or is broken in the near term I am not 100% sure but we did rally more than a 1000 points from that point onwards. In this post I would like to share that context is king and we should not be following textbook patterns. The reason being among others that a bearish engulfing pattern is bearish and can be bullish at times. No pattern in the world is 100% accurate and no one can be 100% accurate in the markets. The view of Technical Analysis is to form a guideline and create a method or a process which suits you and are willing to take losses as part of business expenses. I would like to reason out here why context is king. Why did a bearish engulfing pattern become a positive trigger for the Markets? Nifty had a massive fall in the earlier months making the retail traders convinced that markets were finally in a down trend after having bought the dips last year for a continuation of an uptrend. Newbie traders would be looking at the bearish engulfing weekly candlestick pattern right at the lows of the trend channel and would be convinced the markets were going down. Please share your views as well. Bearish Engulfing On Channel Bottoms a Positive Clue? Will be interesting to see whether we form a short term bottom out here as all the technical indicators are over extended and relief rally or a fresh bull run might be the case with the budget being announced this Monday. 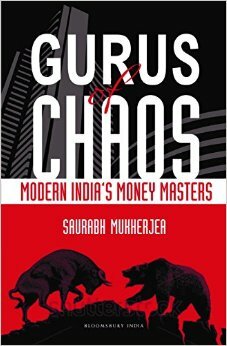 The prerequisite of long term investing, Gurus of Chaos written by Saurabh Mukherjea published by Bloomberg Publishing India Pvt Ltd is primarily a collection of interviews of the top fund managers and their views on investment in the stock market. This book has been written for the novice long term investor or the typical armchair investor and will not be suitable if you are a trader at heart. Though there are many books on the interviews of fund managers, there are few books which contain the interviews of Indian fund managers using examples with the Indian companies. The author himself is the CEO of the institutional Equities business at Ambit Holdings. Along with the interviews of the fund manager, Saurabh also provides with his own personal tips aimed towards educating the common investor with his own investor philosophy and a simple rule based approach. To understand this book the reader is expected to know the basic financial terms and ratios as is used by the fund managers to explain certain views. The author takes us through a series of interviews with similar questions asked to all the fund managers to gain their perspective on what they look for while buying a company share, what is their logic behind selling their share and also the risk management used to prevent losses. It also takes us thorough the life of a fund manager in India and their way of work. Overall, this book focuses on the simple rules of investing and does not delve into greater detail as it is meant for the novice investor and reading this book will certainly result in greater performance in the stock market and looks towards reducing mistakes which are very common. I would personally recommend this book to any person willing to put his savings into quality stock investments and not mere speculation and buying based on newspaper, tips and recommendations. So after the impulse move yesterday today was a consolidation and a doji was formed. The high of today broke yesterday’s high but could not close above however it closed above the 200 dma. For a confirmation we would like the prices to close above the 20dma which stands at 8501 and could be the next potential resistance if the price continue to move forward. The content in this blog is not to recommend buying or selling any securities of any kind, the posts in this blog is just for my own educational purpose and should not be traded in live markets without doing your own due diligence.